Learn to Sing Harmony! 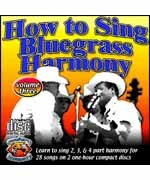 Now You Can Learn How To Sing Two, Three & Four Part Harmony even if you never thought you could! For each song you will hear the chorus of the song with all parts together, the instructor singing the melody, the instructor singing tenor, the instructor singing baritone and the instructor singing Bass. These courses teach you step-by step how to sing in harmony. You'll also learn an easy way to figure out harmony singing parts from you guitar. Works for all vocal ranges. Great for practicing in the car! You don't need your hands. You're all alone & no one can hear you sing. There's nothing else to do on a long boring drive so why not develop a skill of which you can be proud. It's easy!